More than a month later, Syracuse football’s 2019 spring practice schedule is complete. 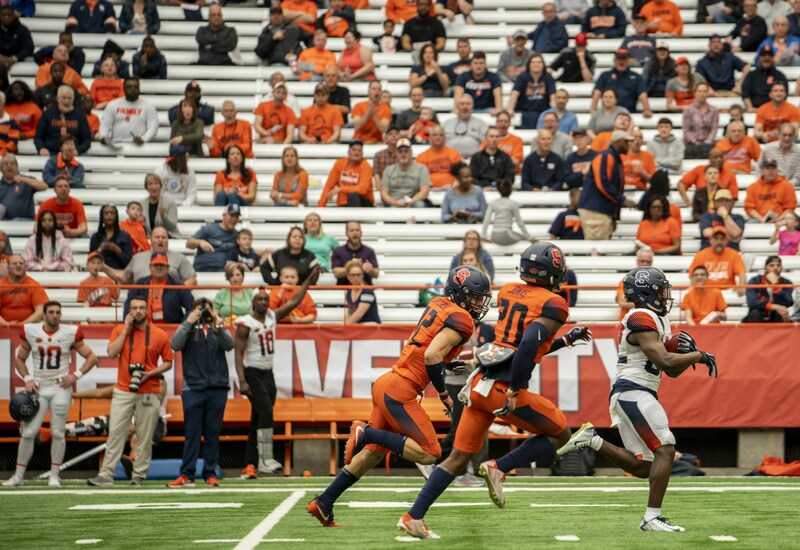 The Orange capped of their spring slate in the Carrier Dome last weekend with the team’s annual spring game. So far, so good for Syracuse, meaning there haven’t been any significant injuries. Dino Babers told the media last week that he expects all players to be ready for pre-season camp. For a team that has growing expectations, that’s pretty much all you can ask for. On top of that, there is growing optimism around the growth of quarterback Tommy DeVito. Many were encouraged by his performance in the spring game, building from last year’s showing. There’s even more optimism surrounding the running backs. Moe Neal returns for his senior season, while transfer Abdul Adams looks to bring his versatile style to the ACC. Freshman Jawhar Jordan could demand snaps as well. The Orange have options in the backfield. With spring ball in the rear view mirror, let’s check out SU’s fall schedule and project how they’ll finish this winter. Liberty’s first season in the FBS starts with a home game against Syracuse. Newly-renovated Williams stadium will be packed for the Flames’ season opener. However, that won’t be enough to take down a much stronger SU roster. There are some wild cards in this game. First-year head coach Hugh Freeze, who spent many successful seasons at Ole Miss, will have his squad fired up to host the Orange. How does DeVito handle the pressure of opening the season as the starter? That’s the question. Take everything said about Liberty and hit the upgrade button. Syracuse continues its road schedule with a matchup against Mike Locksley’s Terps. Locksley, who served as Alabama’s offensive coordinator a season ago, has a number of big decisions to make this summer. He’ll have to choose a quarterback from a group that includes Virginia Tech transfer Josh Jackson. This game should worry fans, especially considering the matchup looming next weekend. That said, I think the week one trip to Lynchburg prepares the Orange for another tough road environment. The biggest football game in the Carrier Dome in recent memory. Obviously, the main goal for SU is to be undefeated heading into week three. The Orange will face a Tigers team coming off an early-season showdown with Texas A&M, a team they barely beat last season. It’s hard to predict the Orange to win this game. I’ve argued for an Orange Bowl appearance just as much as the next guy. A win in this game, though, would put Syracuse firmly in the college football playoff conversation. The edge goes to the more veteran team in a matchup like this one, especially if ESPN’s College GameDay is in town. Ok, time to catch your breath a little bit. SU’s easiest stretch of the season starts when Clemson leaves Central New York. Week four brings a rematch of last year’s season opener, when the Orange beat the Broncos 55-42. Quarterback Jon Wassink is back for the Broncos. He threw for almost 400 yards against the Syracuse defense last fall. Oh, and Tim Lester will be back in the Carrier Dome. That’ll be another challenge for a program that struggled to deal with former head coach Scott Shafer’s return. When looking for easy wins on the schedule, no matchup sticks out more than this one. Holy Cross is coming off a 5-6 season last year. The Crusaders didn’t face any team of the Orange’s caliber last fall. While you can’t count out Holy Cross making strides, it’s hard to see them making enough strides to compete in the Loud House. This is the one game on the schedule that’s a guaranteed Syracuse win. After the Orange’s first bye week of 2019, they travel to Carter Finley Stadium for a showdown with NC State. This is a compelling rematch of last year’s 51-41 Syracuse win in primetime. The Wolfpack will be without Ryan Finley, who has moved on to the NFL. That would seem to be an advantage for Syracuse. The problem? NC State is probably saying the same thing. With Eric Dungey out of the picture as well, this should be a different kind of game. Whoever hits their stride first will have the edge in this one. This will be a tough game for SU under the lights in North Carolina. Speaking of rematches, that’s what the Orange gets the following week at home. Pitt was one of SU’s two losses last season. The Panthers outlasted the Orange in overtime at Heinz Field. Dangerous running back Qadree Ollison is gone, but quarterback Kenny Pickett is back for another season. Pitt has high expectations for Pickett this year after an up and down 2018. The home crowd should give Syracuse the edge in a matchup of relatively even rosters in terms of talent level. I don’t know about you, but I’m pretty sold that Willie Taggart’s ‘Noles are in for a turnaround season. After a first year to forget for Taggart, he gets a chance to regroup with one of the most talented rosters in the ACC. Deondre Francois has left the program, which is probably a good thing for all parties. Running back Cam Akers, who will be in the conversation for ACC Player of the Year, gives FSU a dangerous offensive attack, regardless of who is under center this fall. The Eagles can’t seem to find any sort of consistency. Tailback AJ Dillion is back for one more season, which is bad news for both ACC Coaches and NFL executives. Dillion is one of the most skilled players in the country. Behind a strong offensive line, Dillion should have another big year. Unfortunately for Boston College, the talent level drops off from there. With that said, the roster isn’t that far off from Syracuse’s. The difference will be drastic enough for SU to pick up a bounce-back win. Trap game? Sort of. It’s tempting to pick Duke here, but I can’t do it. Babers proved last year that he can get the most out of his team in November. After a week to rest and get ready for the Blue Devils, the Orange will come out crisp and ready to roll. Keep in mind, with two losses in November, SU will firmly be in the Orange Bowl conversation. Depending on what happens with Miami and a couple other ACC schools, losing a third game may knock them out of contention. The Blue Devils should be in store for a down year, but coach David Cutcliffe always has Duke ready to play. The Cardinals, yet another team SU faces with a first year head coach, aren’t in it for the wins this season. They’re in it to rebuilt the culture after Bobby Petrino’s departure. Last year’s Appalachian State coaching staff has taken over and the Cardinals seem to be well positioned for the future. As for this late-November meeting, it’s up their on the easiest games of the season list. At least that’s what it looks like right now. Two straight years of back-to-back double-digit win seasons could be within reach in this game. Syracuse handled Wake with ease last season on the road, that shouldn’t change when the game shifts up north. The Orange have proven they can beat the mediocre teams in the ACC. Next year, The Demon Deacons might even be below the mediocre range. That’s how things shake out right now: another ten-win season that puts the Orange in a good position to make the Orange Bowl. Do you agree? Please comment and let us know. Wow another 10-2 season for the Orangemen. Everything riding on the outcome of the Clemson game. If Syracuse beats them then the sky is the limit for the Syracuse football team. I have them going 12-0 during the regular season earning the team a trip to the ACC Championship Game and winning it giving them a 13-0 record and advancing to at least a New Years pick 6 game. I started a tradition 10 years ago and when the schedule is released I go through it an make my prediction. Over the years I’ve been made fun of and highly criticized until 2018 when I predicted them finishing with a 11-2 or 10-3 a record. I know I’m only dreaming.